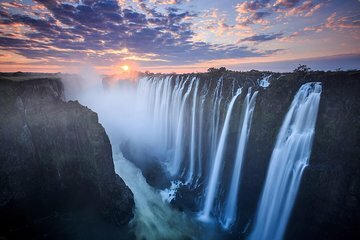 Embrace the spray of mist from the thundering Victoria Falls on a guided tour of the UNESCO World Heritage Site. Learn about the history and geology of the site from your guide as you watch the Zambezi River spilling over the rock cliffs into the Batoka Gorge below. Your guide will also offer coaching on how to capture photos of the 5,604-feet (1,708-meter) wide, 354-feet (108 meters) high cascade.